Jungle Trouble slot machine from Playtech is a 5-reel, 15 payline video slot that was originally developed by bgo Studios and subsequently tweaked by Playtech’s own developers to release on mobile. It has a max jackpot of 1,000 coins per line, and three amazing bonus rounds, one of which is a free spins bonus which awards between 10 and 3025 free spins and has a 2-5x multiplier. You can check out the full Jungle Trouble slot review below. While the heart of the jungle has always been a setting filled with possibilities for an online slot developer, very rarely has it been used to such great effect as in Playtech’s exciting Jungle Trouble slot. 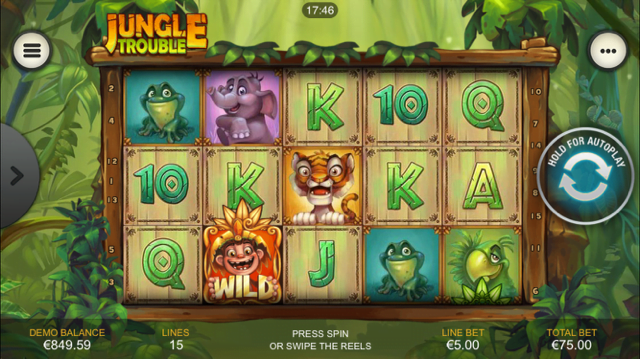 A five-reel, 15-payline title, the Jungle Trouble slot machine features a background of lush green foliage and a selection of high-value animal symbols that include tigers, elephants, crocodiles, parrots and frogs. A coconut symbol acts as a scatter that can trigger the game’s main bonus feature and a grinning monkey is the substitute wild, with these two icons combining to great effect in one of the slot’s in-reel bonuses. Playable from as little as £0.15 per spin across all desktop, mobile and tablet devices, one of the great things about Jungle Trouble is that the game’s free spins bonus round allows players to select from three different game modes – each with its own risk/reward balance – to suit their bankroll. Before we deal with the free spins feature, however, we must first explain one of the most important base game aspects of the Jungle Trouble slot – the coconut multipliers. Essentially, whenever a coconut scatter symbol appears on reels two, three or four, the coconut multiplier above the reel will increase by one up to a maximum of 5x. Whenever a winning payline is created with the help of a wild on any of these reels, the coconut will then drop down and multiply the win by its stated level. Three or more coconut scatter symbols on any given spin, meanwhile, will activate the free spins feature, with mobile casino players then able to enjoy 10-30 free spins with a choice of three different modifiers. The option with the lowest variance sees any wilds that appear nudge down until they drop of the reels, while free spins that only feature high value symbols are also available as a riskier proposition. For the truly brave, however, Multiplier Free Games allow the coconut multipliers to be boosted to a maximum level of 10x. Although players will need to fulfil the criteria mentioned above to reap the rewards from this modifier, this game mode ensures that the slot’s top payout can reach 10,000x. All in all, the Jungle Trouble slot is a beautifully designed and exceptionally well-balanced title that allows players to customise the risk/reward balance of its main bonus feature to suit their playing style. Like the Jungle Trouble slot review? Check out these as well…..